With a cross-section of just 1.25", the Zynn Metal Ring is a stunning accent in contemporary spaces. It provides a comfortable source of brightness while delivering functional light. A seamless aluminum housing and matte opal acrylic diffuser give this luminaire an exceptionally clean visual appearance from all angles. Its refined finishes and minimalist design make it a favorite for today's architects and designers. Hang in a cluster or as a single pendant; this luminaire will add style to offices, hospitality venues, and other intimate spaces. Available in 2', 3', 4', and 5' diameters in direct or semi-direct distributions. 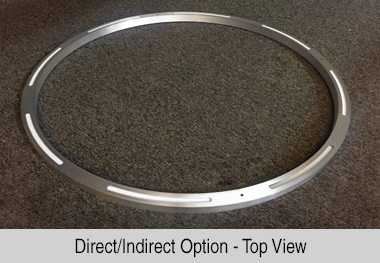 Larger diameters available per project request. Wattages shown are for fixtures with power cord. See spec sheet for energized cable calculations. Featuring one of the slimmest profiles on the market, Zynn Ring shows why better matters. The hand-fabricated aluminum housing is seamless with no visible fasteners. 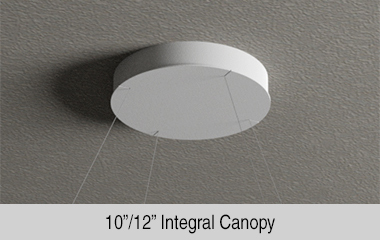 Its evenly-illuminated matte opal diffuser is also seamless and sits slightly regressed from the bottom edge of the fixture. Side-mounted LEDs ensure no tracing of diodes while an internal reflector efficiently directs light downwards. Go cordless with 1mm energized cables or choose a power cord to maximize efficacy (monopoint or straight cable mount options). Zynn Ring is offered standard in 2’, 3’, 4’, and 5’ diameters with larger sizes available upon request. Available in more than 30 paint colors, brushed aluminum, or microbrushed aluminum finishes, this luminaire can be customized to match any décor. Add vertical illumination with the direct/indirect option. Uplight slits and a matte opal acrylic diffuser are added to the top of the housing, creating an 80% down / 20% up distribution. See the Lumen Data table for an output summary. Simplify installation by selecting a monopoint canopy with integrated power supply. Or choose a button canopy with remote power supply for a discreet look.